Painting since childhood, Helen Hall came to Temagami over 30 years ago. She has been able to bring along her talents and abilities enhanced by the late David Mitson, who once headed an art commission under Queen Elizabeth II. Mr. Mitson established his own art show at Expo in Montreal . Mrs. Hall utilized the skills culled from her excellent background training. She taught in Southern Ontario , and later in Temagami. The subject of most of Mrs. Hall's paintings is the Northern outdoors with an emphasis on the magnificent Temagami wilderness. The scope of her artistic vision is reflected in the titles she endows in each piece. In viewing, the entire year is placed in proper perspective with each season resplendently and meticulously illuminated. Helen Hall paints in mixed media, oil and watercolour, and does commission work if there is a particular subject that is endearing to you. With the dedicated help of her husband, Mrs. Hall, has maintained a successful life in the North. In addition to her artistic talents, Helen Hall studied violin under Kosha Brown of the Hamilton Philharmonic Orchestra and later mastered the keys of the Piano. 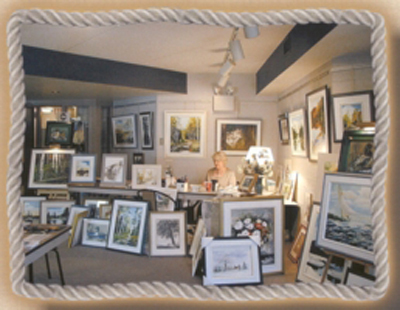 Helen Hall's studio and Art Gallery "The Loft" on Lowell Lake are open to the public year round. "It's communing with others and with nature that you can bring a whole symphony together." H.H.